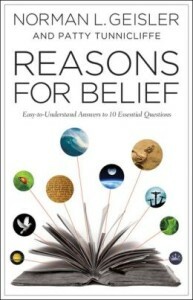 I just got through reading Norman Geisler’s Reasons for belief: Easy-to-understand Answers to 10 Essential Questions. The book is thorough and basic apologetic book on the Christian faith. Geisler is well known as one of today’s leading Christian apologist. His book is very well thought out and organized. His defense of the faith is well grounded in the laws of logic and flow from some of the basic and broad issues of the faith to the more specific and personal issues. 1. Why are you a Christian? 2. Does real truth exists? 4. If God exists, is He the God of the Bible? 6. Is the New Testament full of errors? 8. Did Jesus really rise from the dead? 9. Is the Bible the only ultimate truth source? 10. Is Jesus the only way to God? I like how Geisler contrasted the Christian faith with some of the other major faiths of the world. It helped me appreciate the uniqueness of the Christian faith. The charts (especially the comparative religions) were extremely beneficial. An example proponents the sincerity mentality that is often used to justify this faulty logic is known as “The Blind Men and the Elephant.” Six blind men are asked to touch an elephant and explain what they think it is. One man touches the tusk and says its a spear. The second touches the trunk and thinks its a snake. The third touches the leg and thinks its a tree. The fourth grabs a tail and thinks its a rope. The fifth touches the ear and thinks its a fan. Finally, the sixth guy touches the elephants side and thinks its a wall. People love to use that illustration to demonstrate how sincere people reach different conclusions about the same object. But the illustration has a major flaw. The elephant is NOT a spear, a snake, a tree, a rope, a fan, or a wall. None of the men came to a correct conclusion. ALL WERE WRONG. the reason they were wrong is that they were blind. If they could see they would know truth –that they were all touching an elephant –but they would also know they had come to the wrong conclusion. The same is true of our beliefs. If my premises are wrong, my conclusion will be wrong too. If my beliefs about Jesus are wrong, I’ll reach the wrong conclusion about who He is. Overall I love how the material was organized and presented. I would classify the book not as an easy read, but not a difficult read either and give it a solid 4 star rating. I received this book at no charge from the publisher in exchange for an honest non-biased review.